Morgana Le Fay was known to be the most powerful and evil witch in the world during the medieval days of King Arthur and his famous knights. She was extremely beautiful and her presence was always strangely captivating. She knew and commanded many dark and powerful spells. She could also transform herself into various creatures and beasts. She had the power to easily change her shape to blend into the surrounding shadows. She used this skill to eavesdrop on anyone she felt might cause her trouble or was trying to meddle in her selfish and elaborate schemes. Her abilities made her extremely powerful and able to spy on everyone and everything that was going on in the land. Even though this famous witch was the half sister of King Arthur, she continuously plotted against him and her mentor, the famous wizard Merlin. She used the wizard to learn, grow and perfect her library of potions and spells. One night, she even enchanted herself to look like Queen Guinevere. She tricked Arthur into fathering a child with her. The child that came from this unholy union was named Mordred. This son grew up with a strong hate towards his father, so much he despised everything about the man known as King Arthur. He is said to be the one who eventually killed the famous King in battle. Learn much more about Morgane at Wikipedia. The Sorcerer's Apprentice - Starring Nicolas Cage and Jay Baruchel. In this 2010 fantasy adventure movie, the role of Morgana Le Fay is played by Alice Krige. 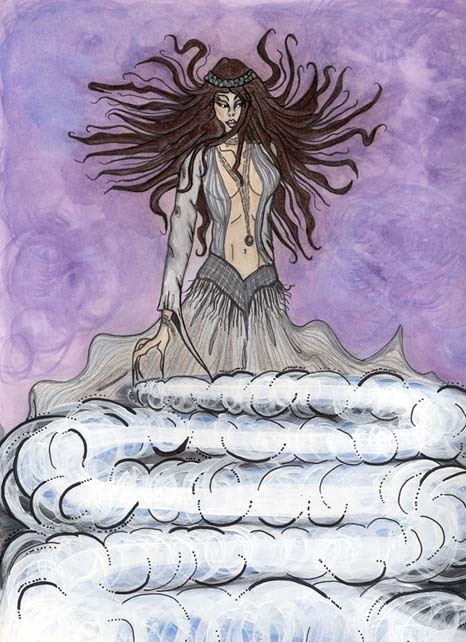 She murders the wizard Merlin with the help of one of his own apprentices, Maxim Horvath. Merlin – Starring Sam Neil, Miranda Richardson, Helena Bonham Carter, Isabella Rossellini, John Gielgud, Rutger Hauer, Martin Short and Lena Headey. This 1998 film tells of the adventures of the legendary wizard, Merlin. Helena Bonham Carter plays the role of Igraine’s young and disfigured daughter, Morgana Le Fay. Excalibur - Starring Nigel Terry and Nicholas Clay. This 1981 film tells of the legend of King Arthur and his knights of the round table. Helen Mirren plays the powerful Morgane Le Fay. This story tells of how this evil sorceress uses her magic to create a child with her half brother, King Arthur. This child later strangles his own mother to her death. Camelot – Starring Joseph Fiennes, Tamsin Egerton, Jamie Campbell Bower, Claire Forlani & Eve Green. In this 2011 fantasy-drama television series, Morgana plots to take the crown from her half-brother Arthur. See below a short video clip of this wicked witch in action.